This book promoting isn’t easy. Yep, this book promoting thing is pretty hard you know! The enclosed picture is of my only copy of what is likely to be the final or penultimate version with all little tweaks done. I’m sure there is a spelling mistake in there somewhere that I spotted a week or so ago, but I’m buggered if I can find it or even remember what it was. Any online sales will generate this latest edition. I did spot one or two subtle errors that probably went unnoticed. For example, I referred to people with a drinking problem as “people who are alcoholic” rather than “people who are alcoholics” – strictly incorrect, unless your name is Marguerita. I’m not aware of anyone who noticed this error which I have now corrected. I suppose I could go on fine-toothed combing it forever and a day, but it all has to stop somewhere. Today, I featured in the local newspaper (for the third time in just a month or two!). It’s all getting a little embarrassing if I’m honest, to the extent that I really don’t want to buy a copy. All I know is that during a barren period of paperback sales on Amazon, I have already had another sale today. If I sell half a dozen because of this article I’ll be pleased. We are awaiting our piece in Real People (one of those chat-style magazines). It could even be out today, as I believe they publish either weekly or fortnightly on Wednesdays. Again, I feel really uncomfortable about it, but for the sake of the book I will accept any kind of publicity within reason. Having spent so much time on it, I owe it to myself and to others to do whatever I can to share our story. There is one reason why I AM looking forward to this feature being published. This is the one where we (or Sarah, to be precise) are bound by an exclusivity contract. It is this that is preventing me from going “national” at the moment. It has taken a long time from when they first interviewed us. If I had known that it would take so long, I’d have declined until a later date. But there is no rush. 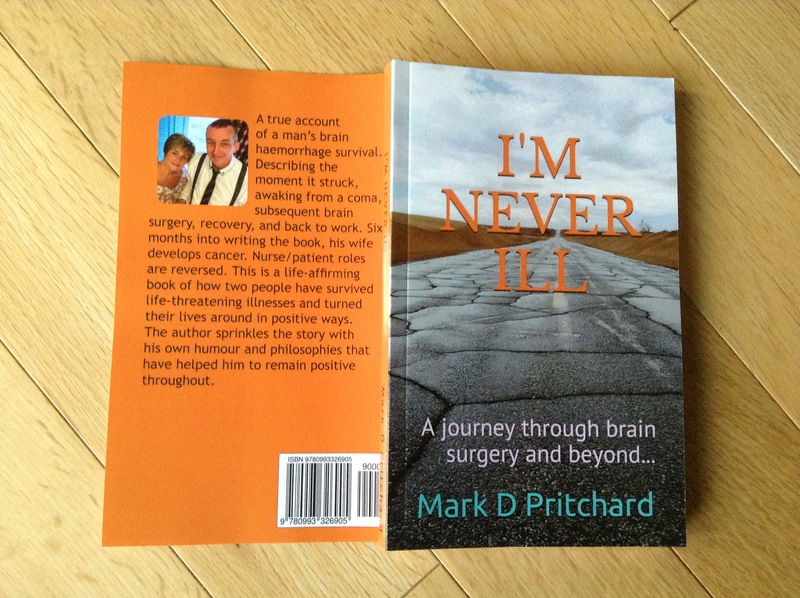 As I have been told a number of times – the main thing at the moment is to get people talking about the book. I’d like to think that word is getting around a little. Time will tell. Whoever expected to be able to write a book and sell a million overnight, eh? Yep, this book promoting thing is pretty hard you know! The picture above is of my only copy of what is likely to be the final or penultimate version with all little tweaks done. I’m sure there is a spelling mistake in there somewhere that I spotted a week or so ago, but I’m buggered if I can find it or even remember what it was. Any online sales will generate this latest edition. I did spot one or two subtle errors that probably went unnoticed. For example, I referred to people with a drinking problem as “people who are alcoholic” rather than “people who are alcoholics” – strictly incorrect, unless your name is Marguerita. I’m not aware of anyone who noticed this error which I have now corrected. I suppose I could go on fine-toothed combing it forever and a day, but it all has to stop somewhere. This is a temporary address and I intend to assign it to my .co.uk address in a month or so. It’s been quiet on the book sales front. However, I am still working behind the scenes gathering followers on Twitter and sharing information with people regarding cancer and brain surgery etc. Even without the sales, it has all become a very interesting experience. Communicating around the globe with like-minded individuals and organisations creates a buzz for me. I still struggle to get my head around the enormity of today’s technology. I’d probably sell more books privately if I were a bit more pushy, but I’m conscious of having rammed my book down people’s throats possibly too much as it is, without badgering them for more sales. I’m happy with what I have achieved so far, and I’m confident that there is more to come. It is still selling in dribs and drabs, and that is good enough for me at the moment. Regarding my sought-after wife and her new-found fame (I keep thinking about the lyrics to the Human League song Don’t You Want Me? – “You were working as a waitress in a cocktail bar…”), there is still more to come. Our story is to feature in the magazine Real People at some point in the near future. She is to be paid an undisclosed sum for her efforts. It won’t be enough for us to retire on, but she may be able to take me somewhere nice for a weekend. We are bound by the exclusivity contract until about 2 weeks after the article is published, so I can’t really do much on a national level until after then. I have recently become acquainted (by pure luck and coincidence) with someone who used to live next door to an enormous figure in the UK world of bookshops. I don’t want to go into any detail regarding who this figure is as I don’t want to name-drop or breach any confidentiality, but suffice it to say that it isn’t Mr W. H. Smith. He is on very good terms with him and has promised to give him a copy of the book to read. Again, there is no harm in trying, and I will continue to sow seeds. There is one glaringly obvious fact that I have learned through my self-publishing experiences so far – people are simply not interested. My confidence in my product, however, has not wavered in the slightest. Every day of every week offers hope that the turning point is about to happen. It’s a little like making a one-off payment for an ongoing daily lottery ticket that will never expire. Every now and then, a few quid drops into my pocket. Maybe one day soon the jackpot will come. I am a very patient man.